Valve lays the groundwork for the HTC Vive VR launch with Steam Desktop Overlay. Valve is adding a couple more pieces to its SteamVR software as the HTC Vive headset inches closer to launch. The SteamVR Beta now includes a Desktop Overlay, providing access to your PC's desktop within virtual reality. The desktop appears as a simple 2D panel, and HTC’s Vive controllers simulate mouse input. 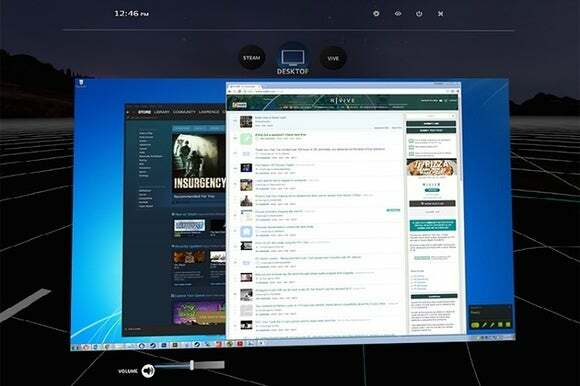 To get to the Desktop Overlay, users must press the Vive controller’s system button to open the Steam Dashboard, then select the Desktop tab. Valve is also adding a way to share and download background images for the SteamVR menu—just in case you’d rather change things up from the standard Tron-like environment. Provided you have some equirectangular panorama images, you can upload them through StreamVR’s workshop section, while downloading and rating other people’s uploads. Why this matters: With the HTC Vive set to launch in early April, new SteamVR features are coming in fast. Last week, Valve introduced Desktop Theater Mode, which lets users play existing games on a large 2D screen within virtual reality, and last month the company launched a performance-check utility to see if your existing rig can handle VR. These aren’t game-changing features, but they’re the type of little touches VR needs to graduate to a real consumer product.